Nelson Mandela, Robert Mugabe And The Countries They Shaped : Parallels Before they came to power, Mandela and Mugabe had remarkably similar lives. But then their fortunes diverged, with Mandela becoming a global icon and Mugabe presiding over a country in sharp decline. As the ailing Nelson Mandela turned 95 this month, the international community celebrated his legacy and rooted for his recovery. Just to the north in Zimbabwe, President Robert Mugabe, 89, is running for re-election this week. He's looking to extend his 33 years in power, which have been marked by authoritarian rule, economic collapse and international isolation. These two men have shaped their neighboring countries in dramatically different ways. Mandela is a global icon in a country often cited as a land of hope. Mugabe is a widely seen as pariah in a country that has endured a precipitous decline. Their global reputations could hardly be more different. With both men in the news, we took a look at their legacies, and two things stand out. First, before Mandela and Mugabe came to power, they had remarkably similar biographies. Second, neither South Africa's successes under Mandela nor Zimbabwe's failings under Mugabe were foregone conclusions. Mugabe led a successful guerrilla campaign that led to the demise of white-ruled Rhodesia and he was inaugurated as the president of the newly independent nation of Zimbabwe in 1980. John Mattison, a former NPR correspondent in South Africa, later worked in Mandela's administration. "I would meet with counterparts from other parts of Africa," Mattison says, "and they would say, very emotionally, he deserved a second Nobel Prize for peace for stepping down because of the example it set in Africa, because so many people in Africa, even in government, are so frustrated that their leaders never step down. Once they get in, they stay. And he was very clear about the constitutional state he wanted to set up and be a precedent for." Mandela's African National Congress has dominated the country since 1994 and has not faced the prospect of losing an election and handing over power. South Africa's current leader, Jacob Zuma, is the country's fourth black president since apartheid ended. In contrast, the longer Mugabe has remained in power, the more authoritarian he has become, Godwin says. "Mugabe has been absolutely consistent. From the very beginning, he realized he could get what he wanted through violence," says Godwin, who now lives in New York and is president of the PEN American Center, the writer's association. Mandela and other South African leaders have rarely criticized Mugabe, arguing that quiet diplomacy is a better option. 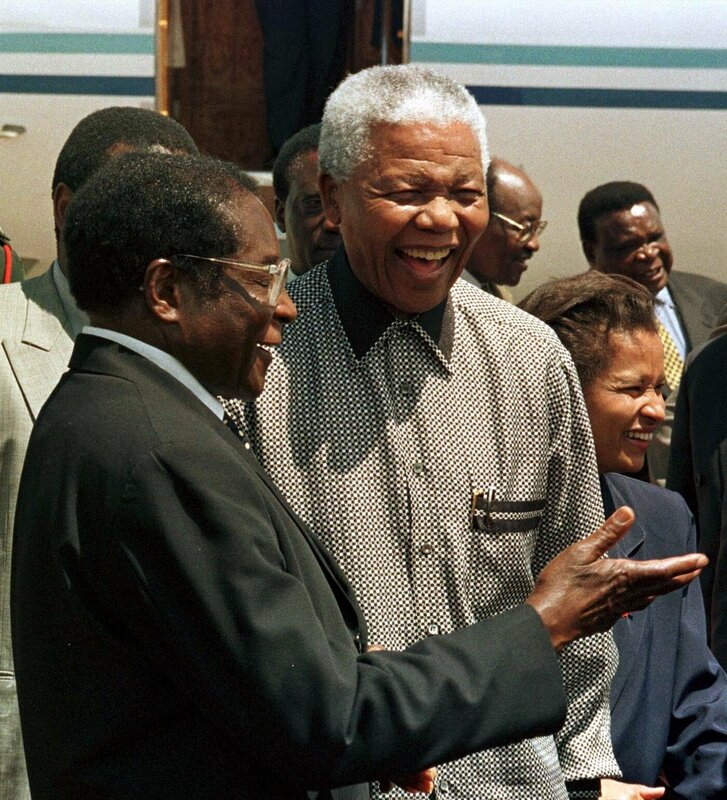 However, Mugabe has rarely held his tongue, and recently took a poke at Mandela. "Mandela has gone a bit too far in doing good to the non-black communities, really in some cases at the expense of (blacks)," Mugabe was quoted as saying in South Africa's Sunday Independent. "That's being too saintly, too good, too much of a saint." Mugabe also defended his decision to run for another five-year term. "My people still need me," he said. Zimbabwe votes on Wednesday, and Mugabe is heavily favored.